Höweler+Yoon's design features a locally sourced granite circle, with a diameter of roughly 80 feet and rising gradually to a peak of eight feet. 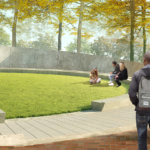 Boston-based architects Höweler+Yoon, along with Mabel O. Wilson, Gregg Bleam Landscape Architect, and Dr. Frank Dukes, are designing a circular memorial to honor the slaves who helped build The University of Virginia (UVA). 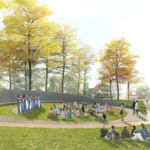 The memorial was approved by the UVA’s Board of Visitors Buildings and Grounds Committee this past Friday. It is estimated that some 5,000 enslaved people contributed to the erection of the University, which was planned by President Thomas Jefferson two centuries ago. Only a fifth of those who worked on the University’s construction have recorded names, almost all of which are singular first names. These will be inscribed on the circular memorial—formally titled the “Memorial to Enslaved Laborers”—and space will be left for further names, should research uncover more. The design features a locally sourced granite circle, with a diameter of roughly 80 feet and rising gradually to a peak of eight feet, that references The Rotunda at the University of Virginia. The architects consulted residents of Charlottesville and worked with the University when drafting their proposal; their efforts included community meetings and a social media campaign. 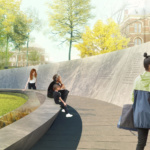 “It was critical that we engage the school and local community to ensure that we heard as many voices as possible, and that we understood what individuals felt the memorial needed to achieve,” said Dr. Frank Dukes, in a press release.